On behalf of everyone at Lara Edwards Dressage, I would like to say a big thank you for the continued support from my sponsors. I cannot explain how amazing these have been with three of my horses, from dreading the summer to now being able to control the horses itching (tails on hay racks, necks on fences etc!!) the tablets given weekly have completely stopped with sweet itch problem I was facing with the horses (And a pony) and the rugs just manage the problem and stop them from wanting to rug anymore. Thank you so much for your support and help it really is appreciated. 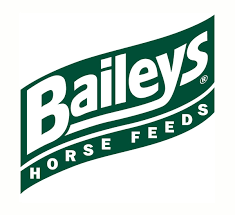 I am very pro ud to say all my horses are fed and brought up on Baileys horse feeds from my Stallions to youngstock, the fantastic condition and trainable attitudes is down to getting the correct diet for all of the horses. Just because we’re “horsey”, it doesn’t mean we don’t keep up with the times – our nutrition team, led by Liz Bulbrook BSc (Hons), constantly review the latest scientific research, into feed technology and equine nutrition, and apply relevant developments to our product range. Baileys has a working partnership with Progressive Nutrition, Iowa, USA, headed by leading American equine nutritionist, Don Kapper which gives Baileys access to the extensive research that he and Progressive are undertaking and offers the potential for further innovations across our range. We are also proud to include Alltech naturally produced feed additives which are backed by years of research and proven to bring real nutritional benefits. With our continuous investment in production technology too, the “science behind Baileys” truly is of the highest calibre. Please see their webpage for more information or contact me for an advice or experiences I have had myself. lara uses stay calm on a selection of her competition horses. It is a liquid feed supplement formulated to provide a calming effect on horses and ponies that display nervous and temperamental behaviour. It is ideal for competition horses that may become stressed when competing and travelling, and is also effective in many other situations where the horse may become anxious. Stay-Calm is designed for horses of all ages, breeds and disciplines, and can be used in conjunction with other Equiform supplements with confidence to reduce stress at times of excitement and anticipation. To achieve a calming effect Equiform have formulated a product containing magnesium, Vitamin B1,B2 and B3. The addition of Vitamin E also helps maintain a healthy nervous system. Tryptophan has also been added as it is naturally occurring in the horses’ body and acts as a calming agent. To complete the formulation, key natural flower remedies have been included. It is best to allow around 3 days for Stay-Calm liquid to take effect before a stressful period is expected. Stay Calm should be fed to horses at a level of 60ml per day & ponies 30ml per day. It may be beneficial to feed 90ml during the 1st 5 days; the level of Stay Calm fed may be reduced gradually over time depending upon the level of stress and the behaviour of the horse. Lara uses this rug and leg wraps on all her horses, even the youngsters to help with suppleness and more importantly relaxation. The Activo-Med range includes equine therapy systems, rugs, leg wraps, light therapy systems, water treadmills, spas and solariums suitable for horses, riders and their dogs. The Impulse line systems consists of cyclonic massage, pulsed electromagnetic, light therapy and cold therapy and can be used to improve suppleness and flexibility pre and post exercise, soft tissue problems, arthritis and for rehabilitation after injury. The Aqua line range includes equine water treadmills, spas, dry treadmills, vibrating floor, weigh scales and solariums suitable for improved fitness, strength and recovery. Buy New, Hire or Buy Reconditioned are the key options to allow you and your horse ‘feel the difference’ that pulse magnetic therapy creates. Leading the way in equine therapy systems, a highly effective system combining pulsed electromagnetic field therapy (PEMF) with cyclonic massage covering the horse from poll to tail, including the shoulder and thigh areas. Whether you use the rug to support performance or as part of rehabilitation, it couldn’t be easier to use – just select a pre-set programme and the rug does the rest. As an extra benefit, the control box also operates other Activo-Med equipment such as leg wraps and light therapy clusters, pens and pads. Supplier of top quality riding boots including Petrie, Konigs and Cavello. Nikki offers a bespoke service all in the comfort of her own home. She stocks hundreds of pairs so you can always take a pair away rather than having to wait to 8/12 weeks normal for bespoke boots. Due to Nikki’s competitive nature she also is the best price on any boots you will find in any of the shops or online stores around. All of my training and competition boots are now supplied by Nikki. Bodyguard and Felix are exceptionally lucky to be sponsored by Jess and her team at Excel Vet Physio so recieve monthly treatments and exercises helping to reduce and eliminate injury caused by the stresses of life as a top class dressage horse. Excel vet physio provides a mobile physiotherapy service for all different types of animals. I work closely with veterinary practices, farriers, saddlers, trainers and dentists in and around Lincolnshire making sure each individual animal gets the ultimate care package. New mobile equipment , makes it easy to travel to clients homes or different practices to administer and treat a variety of cases working around owners day to day commitments and making the experience as stress free as possible for the animals. MOJO Europe have offered Lara sponsorship in the form of the fantastic new Performance Wristbands and Velcro Straps for the horses (the results from tests are amazing) that are embedded with holographic technology that has been used by elite athletes for years. Now, this technology is available for the rest of us! Cyden Cadans wears his on his headcollar and bridle, and all Laras horses now competing wearing their MOJO’s. The holographic discs used in MOJO energetic wristbands are programmed to work with your body’s natural frequencies to get the most out of yourself. Wristbands are available in different size in a variety of colour combinations. MOJO bands are REVERSIBLE and COMPLETELY WATERPROOF. For more information on these wristbands or equine patches please contact Lara as she now has a variety of these to sell and can demonstrate the effects of these to you. If you suffer with arthritis or general aches and pains these can be considerably reduced or even removed with these bands. Lara is very pleased to have accepted sponsorship from World Equestrian Games sponsor Alltech and is already noticing the benefits of feeding LifeForce Elite to all her horses. Lifeforce Elite is specially designed for competition horses and those faced with stressful situations. It supports a healthy immune system, increases the availability of antioxidants and creates a healthy digestive environment. The Range consists of three all-natural, daily nutritional supplements backed by more than 30 years of Alltech’s scientifically-proven, fully traceable technologies, containing cutting-edge ingredients that fully comply with competition standards, where consistency and safety are a top priority. If you would like more information on this product or any other of their products please contact Lara or visit the Alltech website. With the well-being and performance of our horses in mind, we looked at the available gel pad products on the market and thought we could do better! We discovered Akton® Polymer as our raw material; a renowned viscoelastic polymer that has been rigorously tested worldwide in 40 years of human grade, peer reviewed, research. It is universally trusted in human clinical and sporting settings for its superior pressure relieving, impact and sheer force reducing qualities. Every horse deserves to be a VIP! Lara and her team of horses are very kindly sponsored by Le Jabot & Stock company. Jane has an artistic flair that many can only dream of, each and everyone of her neck wraps and capes are individual yet always very eye catching. All of the work contained within this site is designed and made by Jane personally, her ideas and inspiration come from producing and showing top class hunters and show cobs over the past three decades, coupled with a keen eye for ladies fashion. If you are unable to see anything that fits your particular taste, Jane can design and make something for that special occasion whether it be an equestrian stock, individual fashion accessory or as a practical item of clothing to keep warm when walking the dogs. PM Equestrian Ltd are a UK distributor for Antares saddles and accessories, Parlanti Roma bespoke riding boots and Alessandro Albanese clothing. Physiotherapy Clinics – Roy Midwood who also treats Olympic standard event horses and top racehorses. He will treat Humans, Horses and Dogs. Guy’s methods of training have been strongly influenced through his travels around the world and by studying some of the world’s great trainers including Martin Black, Pat Parelli, Craig Cameron, Clinton Anderson, Buck Brannaman, Bill and Tom Dorrance and Ray Hunt. Although Guy’s techniques are constantly evolving, as he seeks to improve and refine them, the principles of his programme remain the same as he seeks to work with horses in a way that they can understand and provide an environment where they can learn effectively. Guy seeks to continually learn and study and believes he has learned something from every horse he has ever worked with. Lara now rides all her horses in Childeric Saddles – having tried one on her stallion Cadans the difference and freedom she felt for not only herself but the horse resulted in her swapping all the Stallions saddles. If you would like to try a Childeric or sit in one, no obligation at all to buy one please contact Lara. In 2000 Tricia agreed to become the distributor for the UK and set up Tricia Bracegirdle Limited, trading as TB Saddles and Childéric UK. Tricia Bracegirdle is director of TB Saddles and senior specialist saddle technician with Luc Childéric Saddles. Luc’s range is an established favourite throughout Europe and America.